Adopt a new friends today from the Humane Educational Society! Arrow is quite the handsome orange tabby. Just look at those chubby, chipmunk-like cheeks! So adorable! Arrow is a mild-mannered little guy. He likes to snuggle, nap, and even cozy up with his kitty pals. 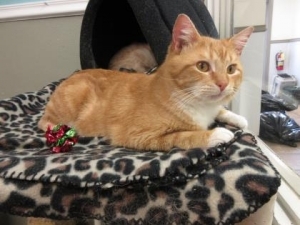 At two years old, he’s the perfect age if you’re looking for a cat who is young and playful yet out of the kitten stage. Come adopt this cutie today at the Humane Educational Society! 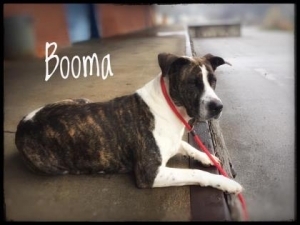 Booma is a shy girl who needs some TLC. In her kennel, she sometimes seems intimidating. That’s just because she’s a big chicken at heart. Once you take her out and spend some time with her, you’ll find she just wants someone to love and to love her in return. She is 5 years old, so she’s not especially playful. She does love to go for walks. She has some really mellow dogs she likes to hang out with in play groups. Mostly, though, she just wants to be with someone who loves her.